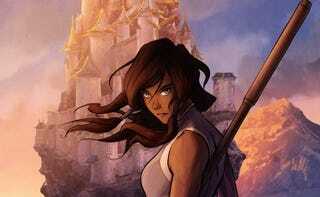 The news came yesterday that Book 3 of The Legend of Korra was being pulled from Nickelodeon to air online. So of course the creators of the show had to address it at this morning's Comic-Con panel — which they did, before moving on to celebrate the show. So obviously there's been a big shakeup. We wanted to address that quickly but we don't want to take too much time because we're here to have fun and we have stuff you guys haven't seen yet. But pulling it off the channel and moving it to digital exclusively is part of the huge sea change in the whole industry. I'm sure you've seen articles about cable numbers and streaming and companies doing their own content and all sorts of stuff. So obviously we're in the middle of a huge change. And things have changed just for us since we did in Avatar in 2005-2008 and then when we came back in 2012. And when Book 1 of Korra came out it did pretty good on TV but its online presence was just insane. Not only the chatter from all the fans but the actual numbers in terms of digital downloads and streaming, it's just been huge. And as the show's gone along, by Book 2, the numbers in the digital streaming greatly outweighed the channel . It's no secret that Avatar, especially Korra, is not typical Nickelodeon fare. And so they've had kind of a hard time fitting it into their programming. But basically the Book 2 finale, the numbers were insane when they streamed it, when it went on Nick.com. It was the biggest event they had that year. And that show, digital downloads for that season was amazing. And, as you've seen, not so much on the channel. So it's just part of this shift over. It definitely caught us by surprise and it wasn't necessarily done in the smoothest way and that was upsetting to many of you and us as well. So, we're moving over to digital. It's actually a plan that was in place earlier and it changed course and then went back in a bit of a messy way. But thanks for sticking with us. So it sounds like Nickelodeon didn't exactly tell them they were doing this before moving ahead. It won't effect what the show is or what stories we're telling. We've already written the scripts, we've finished all the pre-production, we're just doing post and Studio Mir is finishing the animation. Other than it not being on the Nickelodeon main channel nothing is changing. You get to see it, which is the important thing. And that was it. They moved on to thank the audience, which had started lining up last night to see this panel and screened today's episode, which the audience loved. So, while there's some hinting that the move wasn't anything like planned, the creators are happy to get the opportunity to finish out the season.